People who move to a neighborhood like ours are enthusiastic and like things. They like activities and experiences and noodles and trains and food trucks and ice cream. That’s why we choose to live here. We could find the same apartment in another area for less money. We could drive from that other apartment to another neighborhood for similar restaurants, but that lifestyle does not interest us. We live here because we can walk from our door to a street party to a brewery to a restaurant to a gallery to another brewery to a food truck then to Golden Cow Creamery. Ice cream is delicious. Pretty much everyone likes ice cream. I like it. My kids like it. My wife likes it, too. Ice cream is popular, and it has been for thousands of years. Hippocrates said it “livens the life-juices and increases the well-being.” I’m down with that. On the advice of Hippocrates, I took my children to Golden Cow last week to help me with this review. They were thrilled with the idea, even before they knew it was an ice cream shop. Because they are Southenders, and they like things. Now for some background on the ice cream shop - Golden Cow Creamery is owned by Charlotteans living in South End. They use only milk, cream, eggs, and sugar as the base, with whole ingredients for their flavoring. Golden Cow’s menu consists of 6 standard flavors and 3-4 that are changing and rotating monthly. For those with dietary restrictions, Golden Cow has you covered. They have at least one vegan flavor at any given time. And although they often have flavors that contain gluten, they don’t use gluten ingredients in their bases, so the machines are never contaminated. Allergens and ingredient lists are readily available in the store. 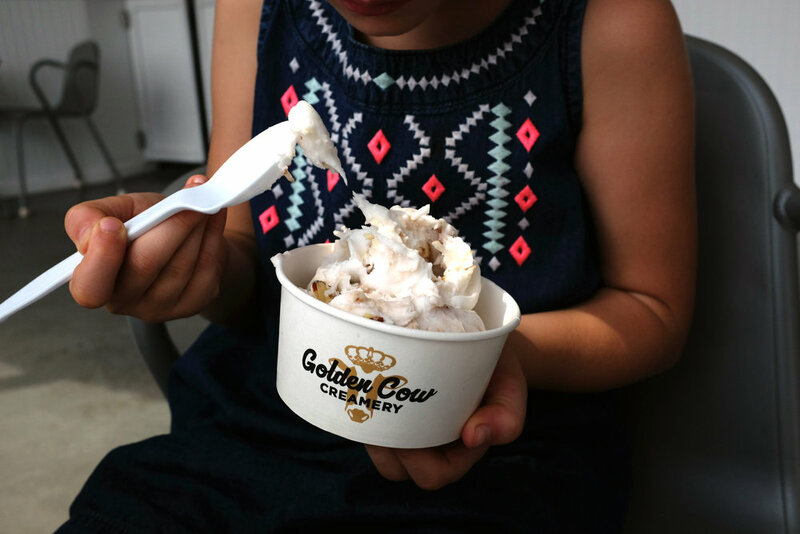 While there’s nothing revolutionary about an ice cream store using fresh natural ingredients, it’s extremely well executed and a welcome addition to the neighborhood. Dunkaroos [Ice Cream Sandwich] - If you don't remember Dunkaroos, look them up. They were (are? apparently you can still get them in Canada) little kangaroo shaped cookies with a side of frosting with rainbow sprinkles for dipping. Of course, because who can think about kangaroos without thinking about rainbow sprinkles, right? Anyway, this ice cream tastes exactly like its inspiration, only frozen. It is delicious and almost made me laugh out loud; I'm not sure why. The ice cream is also available as a sandwich, spread between two sprinkle-laden sugar cookies. It’s really well done. The cookies have that classic sugar cookie flavor that pairs great with the ice cream. Remember to let them warm up a little, though, since the cookies straight out of the freezer are hard (obviously) and the edges a little dry. Highly recommended. Salted Oreo - Possibly my favorite ice cream I've ever eaten. It’s simple - a salty vanilla base with big chunks of Oreo cookies. That’s it. The salt level in the ice cream is higher than you would guess, and it’s just right. It’s wonderful ice cream. It’s also available sandwiched between two chocolate chip cookies, but I have yet to sample that - obviously I’ll be back soon. Vanilla - This is classic vanilla as opposed to “french vanilla” (which contains speck of vanilla bean) and it is good. It’s lighter in mouthfeel and doesn't fill you up too much, which makes me think they upped the milk to cream ratio a bit. It is sweet but not overwhelming. The actual vanilla flavor is a little lacking, though, so if you really like a strong vanilla taste you might want to skip this one. Chocolate - Wonderful texture and feel. Again, not overpowering or heavy. It also has a distinct malted milk flavor on the back end, like a Whopper, which is nice. My only gripe with this ice cream is that they call it Rich Chocolate, which tends to imply a deeper, darker chocolate flavor than average chocolate ice cream, and this is basically frozen chocolate milk. It’s not a problem with the ice cream, more with the expectation the name gives. It’d be better named Chocolate or Milk Chocolate, because thats what it tastes like. Despite the misnomer, it is actually quite good. Strawberry - This was my least favorite. It’s obviously strawberry ice cream, but the flavor is a bit too light and I would have preferred it with small chunks of fresh strawberries - but that’s just me. There’s nothing terribly wrong with it, it just didn't stack up to the rest.